Using AWS, I can shut down surplus capacity when demand is negligible. This capability, combined with the use of reserved Amazon EC2 instances for a year or more at a discounted rate, reduces our infrastructure costs by about 30%. MYOB is a leading provider of online business management solutions to 1.2 million small and medium businesses and accountants in public practice across Australia and New Zealand. Headquartered in Melbourne, MYOB has approximately 1,300 employees and a network of 40,000 accountants, bookkeepers, and other professional partners. In 2015, MYOB won the prestigious “Most Innovative Large Company” award from Australian business magazine BRW, and earned a Canstar Blue four-star customer satisfaction rating for small business accounting software. Businesses rely on MYOB’s business solutions to undertake activities such as accounting, payroll, customer relationship management, retail point of sale, job management, and tax administration. MYOB was one of the first companies in Australia to recognize that the cloud was the future for its business. “We have a culture of innovation and experimentation, so we were prepared to trial new technologies and opportunities,” says Adam Ferguson, general manager, engineering and experience at MYOB. The business needed an infrastructure that could scale cost-effectively to support customer demand for new and existing services, and maintain availability at a level that gives customers confidence that MYOB’s services would be constantly available. MYOB started running its websites on Amazon Web Services (AWS) in 2011. Two years later, it built its online enterprise resource planning (ERP) solution, MYOB Advanced, on AWS because of its experience with the cloud-service provider. “When we started developing the ERP solution, we evaluated a hosting provider as well as a number of cloud-service providers, including AWS,” says Trevor Leybourne, product development manager at MYOB. “We realized that running our own hardware, software, and systems in a third-party datacenter was not an option for us because of the expense and management involved.” The business conducted a thorough review of AWS and another cloud product, including comprehensive performance testing, before deciding on AWS. “AWS has a Sydney Region, which is very important to us from a product performance and a latency perspective. Our customers are in Australia and New Zealand, and data sovereignty was also a concern. We also wanted to use a range of flexible cloud services to optimize the ability of the system to meet customer needs,” Leybourne says. MYOB is now using Amazon Relational Database Service (Amazon RDS) to run the relational database component of MYOB Advanced, while Amazon Elastic Compute Cloud (Amazon EC2) provides horizontal and vertical scalability for the company’s application servers. Amazon Route 53 operates as a scalable Domain Name System web service. MYOB obtained assistance from New Zealand business Fronde to design the infrastructure for PayGlobal Online, while its own team undertook the management and migration. “AWS has been proactive in linking us up with vendors and partners to help us utilize our infrastructure more effectively. These partners include ITOC — a business that specializes in ensuring we’re managing our AWS resources efficiently and cost-effectively,” Ferguson says. 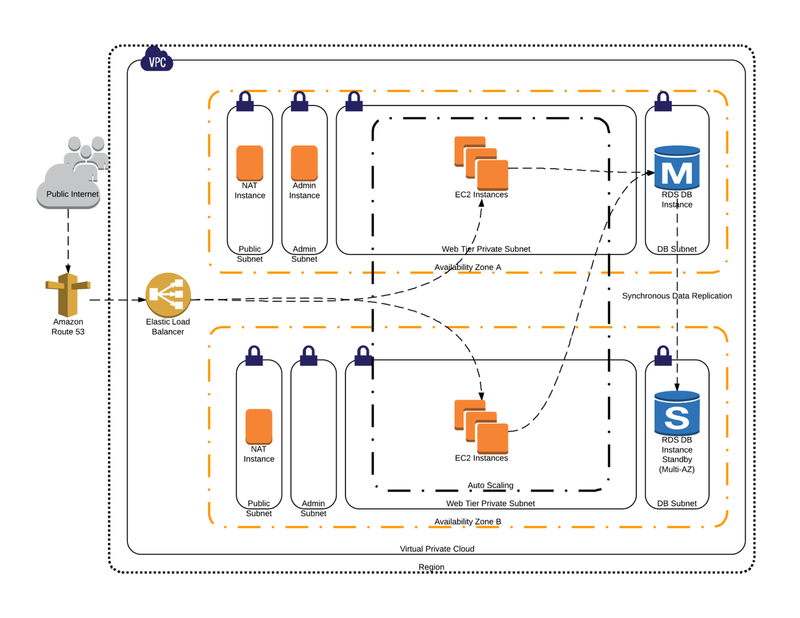 MYOB also uses AWS CloudFormation scripts to create new AWS environments in the event of a disaster, while Amazon CloudWatch provides monitoring and alert services across MYOB’s applications and AWS environments. “We now have a wide range of AWS services to manage our environments, reduce cost, provide more scalability and more reliability, and deliver better products to our customers,” says Ferguson. MYOB has worked closely with AWS to maintain its infrastructure costs as more customers adopt MYOB’s cloud-based business management software. “We track cost-to-serve pretty closely, and look at our costs in absolute terms as well. We receive very strong support from our senior executives as they welcome the value AWS provides,” says Ferguson. Leybourne acknowledges that AWS is more cost-effective than a physical infrastructure, particularly when taking into account the expense of procuring and installing hardware. “If I build my own datacenter, I need to buy enough hardware to support demand peaks. But most of the time, I would have surplus capacity,” he says. “Using AWS, I can shut down surplus capacity when demand is negligible. This capability, combined with the use of reserved Amazon EC2 instances for a year or more at a discounted rate, reduces our infrastructure costs by about 30 percent,” says Leybourne. The scalability provided by AWS has helped MYOB support growing customer demand for new products such as MYOB Advanced. “Since we launched the product 18 months ago, we had exceptional growth of 204 percent year on year. We’ve been able to scale and grow the AWS infrastructure to align with demand, which we would never have been able to do if we were buying our own hardware,” says Leybourne. MYOB is extremely pleased with the performance of AWS and plans to continue using AWS tools and functionality to deliver new services and capabilities. “We’re using AWS across several products at the moment and plan to expand this in the future,” says Ferguson. An Advanced Partner of the AWS Partner Network (APN). Fronde offers a range of IT services and Cloud solutions for customers in New Zealand. For more information about how Fronde can help your company build and manage your AWS environment, see Fronde’s listing in the AWS Partner Directory. An Advanced Partner of the AWS Partner Network (APN). ITOC provides a range of expert services for customers to realize the full value of Cloud and DevOps. For more information about how ITOC can help your company build and manage your AWS environment, see ITOC’s listing in the AWS Partner Directory. To learn more about how AWS can help run your business applications, visit our Business Applications details page.